In fact, "a Vision greater than oneself"
your ideal tribe to share their greatness, too. You know you've envisioned more for your life. 1. Autonomy – the desire to direct our own lives [YOUR OWN MAP]. 2. Mastery — the urge to get better and better at something that matters [SIGNATURE GENIUS]. 3. Purpose — the yearning to do what we do in service of something larger than ourselves [VISION]. 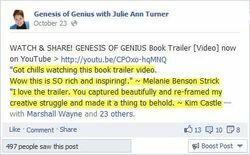 I've guided more than 750 visionary women entrepreneurs (and many wise men) to craft success after success, on their own terms - on all three of these 3 ESSENTIAL ELEMENTS ... and recently, with the success of my international Bestseller GENESIS OF GENIUS, we've witnessed ever-rising demand for me to create a transformational series and to personally guide you to visually map out and apply this proven Success System for yourself - and this week we're offering this powerful opportunity to you! • Your OWN MAP to success on your terms. ... but, most important, I will share the exact SYSTEM all thought leaders and visionaries throughout time have used to impact the world, and create success after success. 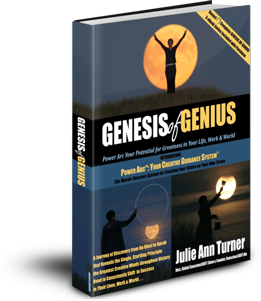 1-on-1 "Discover Your Signature Genius" Session with me right away - so you'll benefit from the powerful insights in that Session even before the Course starts the 3rd Week of February! this is your invitation to claim your GENIUS today. & Into the LEAP of your True GREATNESS! elminate wasted time, boost meaning and fulfillment. (save more than 60% today - or until this special class fills). Session with you - that ALONE is worth the entire investment! 2 months… now, after our work together, I just met with a CEO this week and in 5 minutes he understood I was the right person for him to work with. And at 10 times what I was charging previously for this same program! All this clarity and precision about my offers and value comes from the [Signature Genius] work we’ve done together – of asserting myself and believing in myself, and understanding of the specific value I bring and understanding exactly what I do. * And the Vikings' Vision led to their success - in fact, to a Viking Age, from 793 AD to 1066 AD (though not great news for Britain and other conquered territories, at the time), and the Vikings used their own SIGNATURE GENIUS - their remarkable ships and innovative navigation techniques, and they changed the world by introducing laws and democracy along their path. In this GENESIS OF GENIUS Leap Course, we'll guide you past the obstacles and the naysayers (even voices of judgment inside yourself), who've tried to tell you that you couldn't make your vision real - in fact, we've got special tools and surprise bonuses to help you do just that (and give you some invaluable, innovative navigation techniques along the way)... this is your call - we're saving your seat in the circle of Visionaries, because you're brave enough to live into that larger vision - that expression of your true genius and potential ... it's time for you to claim your GENIUS - and conquer new territory on your terms. Join our merry band of fellow Visionaries here.